With a footprint claimed to be one third that of competing devices, the MAX20069 has integrated LCD bias to deliver a small footprint for larger automotive displays. According to Maxim Integrated, automotive infotainment designers can now upgrade to bigger, higher resolution displays with ease and at a reduced cost, using the MAX20069 from Maxim Integrated Products. The device is claimed to provide the industry’s first single chip to integrate four I2C-controlled, 150mA LED backlight drivers and a four-output thin-film-transistor liquid crystal display (TFT-LCD) bias. The IC can reduce design footprint up to one-third compared to the closest competitor’s parts, adds the company. 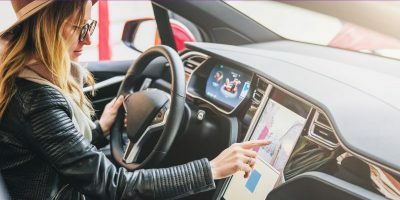 As automotive displays grow larger and more sophisticated, offering informationadn entertainment options, vehicle instrument clusters are expected to migrate to 12.3-inch displays soon. The MAX20069 supports larger screen sizes and higher resolution by providing positive analogue supply voltage (PAVVD) and negative analogue supply voltage (NAVDD), both of which are required for low-temperature polysilicon panels (LTPS) that deliver higher resolution and lower cost than amorphous silicon panels now currently in use. The IC also supports the high currents that next-generation displays require, with 150mA per channel in the four-channel LED driver for eight-inch or larger displays and higher resolutions. MAX20069 operates over the -40 to +105 degree C ambient temperature range and is available in a 6.0 x 6.0mm TQFN package. The MAXS20069 is also claimed to delivers twice the dimming ratio compared to the closest competitor, maintaining panel readability during transition to different light conditions. The MAX20069 also supports increased resolution through a 10,000:1 pulse-width modulation (PWM) dimming ratio at 200Hz. A safety feature is an I2C interface which quickly pinpoints problems, directing the microcontroller to adjust to conditions or alert the driver of a failure. For EMI migration, a 2.2MHz switching frequency, spread spectrum and phase-shift capabilities help mitigate interference and emissions, says Maxim. The MAX20069EVKIT# evaluation kit is also available.